At the Universities SA-Association of Commonwealth Universities (USAf-ACU) symposium on developing the capacity of early career researchers held in March, presenters made a compelling case for why South Africa’s emerging researchers need to be supported. The first motivation, presented by Dr Bheki Hadebe, Director: High End Skills in the Department of Science and Technology (DST), was informed by findings of a 2017 study commissioned by the DST and USAf to the University of Stellenbosch’s Centre for Research on Evaluation, Science and Technology (CREST). This study was undertaken to a) establish the profile of lecturers and senior lecturers in South Africa’s university system; to determine what proportion of lecturers and senior lecturers were research-active (i.e. publishing); and what proportion were actively applying for research funding. 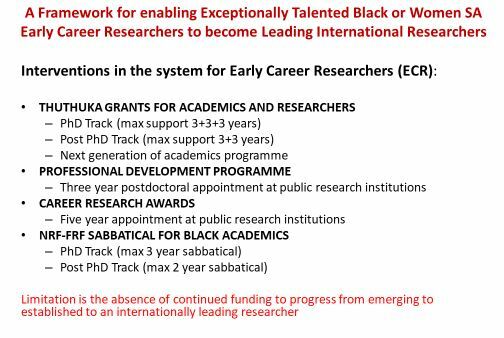 The enquiry also sought to identify b) key research drivers within South Africa’s public university system and c) key enablers for, and impediments to building a pipeline of emerging researchers. Although the Emerging Researchers report was presented — first to senior executives and heads of research within public universities in March, 2018 to facilitate engagement among them with the report findings and, secondly, to a similar and wider audience at USAf’s Research and Innovation Dialogue in May, 2018 — it was decided that the time allocated to this theme at the Dialogue did not afford it justice. That is how the idea of the symposium of 18-19 March was born. A summary of the sector-wide problem as discussed at the symposium, is offered here. On the profile of lecturers and senior lecturers within the university system, the Emerging Researchers study found that lecturers and senior lecturers constituted 12 686 out of 17 757 (72%) of all teaching staff. 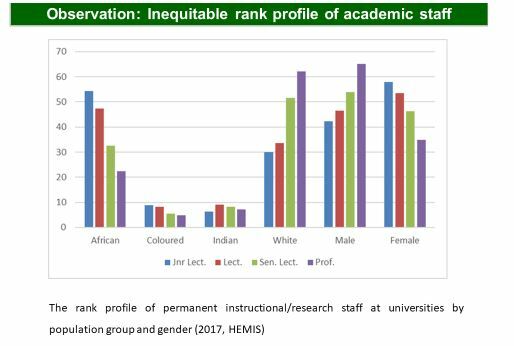 Female academics constituted 46% of all senior lecturers and 53% of all lecturers; Blacks accounted for 46% of all senior lecturers and 63% of all lecturers. 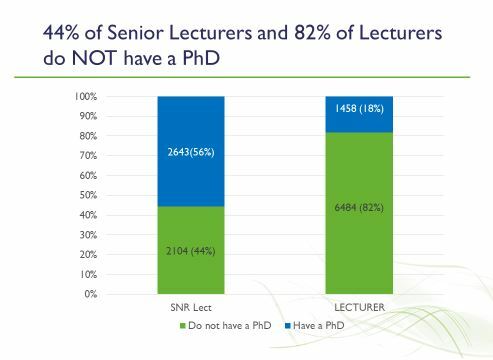 The study also found that 44% of Senior Lecturers and 82% of Lecturers did NOT have a PhD. This figure of 82% is significantly higher than the comparable data on HEMIS and some level of reconciliation will be have to be performed. 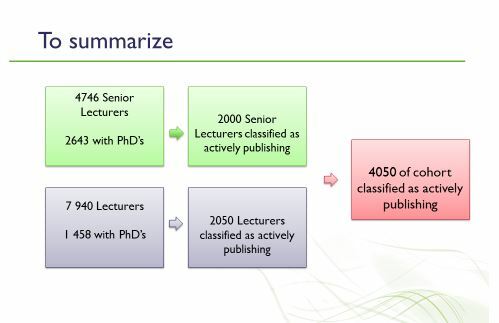 Using publishing at least one article unit in two years as an indicator of “actively publishing,” the study found that approximately 42% of senior lecturers could be categorised as actively publishing – considering that SA universities had a total of 4 746 senior lecturers in 2015. Using the same criterion, the study also found that 2 050 (25%) lecturers could be deemed to be actively publishing when taking into account the head count in 2015, of 7 940 lecturers at SA’s public universities. Stated differently, of the total of 12 686 teaching staff, only 4 050 (just over a third at close to 32%) were actively publishing. Due to a co-relation already established from numerous previous CREST studies, to the effect that academics in possession of a PhD publish more than their peers without a doctoral qualification, the researchers made an assumption that if only 40–45% of senior lecturers were actively publishing, in a situation where 56% of them had a PhD, most of those classified as actively publishing were those in possession of a PhD. Taking into cognizance the fact that most academic publications produced at SA universities originated from professors or associate professors (90% of whom had a PhD), the CREST researchers found it logical that only about 25% of lecturers were actively publishing, as only 18% of all SA lecturers had a PhD. Again, it was quite likely that those categorised as actively publishing were those who held a doctoral qualification. To answer the question: what proportion of academics were actively applying for research funding, the researchers submitted to the National Research Foundation (NRF), 3 673 names found in the CREST database who could be linked to a valid birth year. Approximately one third (1 133 or 31%) were found to have applied for or received funding. 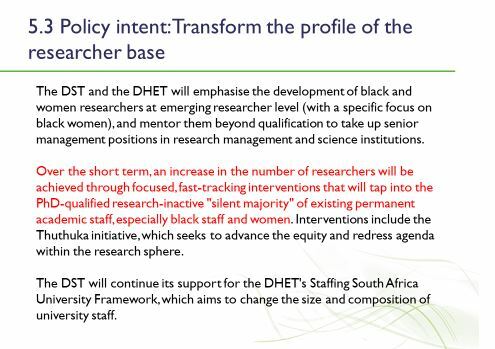 Of these, 987 (87%) had received funding, either through DHET’s next generation of academics programme (nGAP) or through the emerging or established researchers’ programme. Some researchers could be found in more than one funding category, though. Ultimately, the 2017 study found that of the lecturers and senior lecturers that could be labelled as actively publishing, only a third had attempted to apply for the NRF funding in the past 10 years. That 70% of lecturers and senior lecturers were not applying for NRF funding was indicative of the existence in the university system, of what could be termed a “silent majority” of academics not accessing research funding. 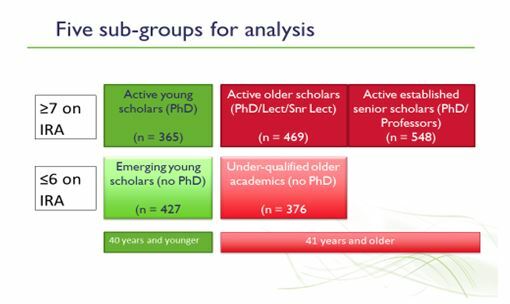 However, the relationship between the academics’ rank, age and qualification was found to be a lot more complex and therefore, the ‘silent majority’ could not simply translate into “emerging researchers.” The silent majority also included academics well above the age of 50 who had not progressed beyond Masters. The most dominant impediment to research was found to be insufficient time for research –linked to enormous teaching loads. A large number of respondents reported teaching ‘impossibly large’ numbers of undergraduate students, the management of which left no time for research. Respondents also reported a range of supervisory, administrative and other professional service-rendering tasks that were perceived as an increasing burden on the individual academic and led to a deep sense of frustration. Academics also complained about a bureaucratic red tape which left them wondering about what they were expected to do (compliance culture rather than an academic culture). Furthermore, they cited performance demands by management to meet certain pass rates and throughput rates, which further reinforced a culture of compliance rather than a culture of excellence. Working with academically underprepared students was also a problem expressed by many respondents. 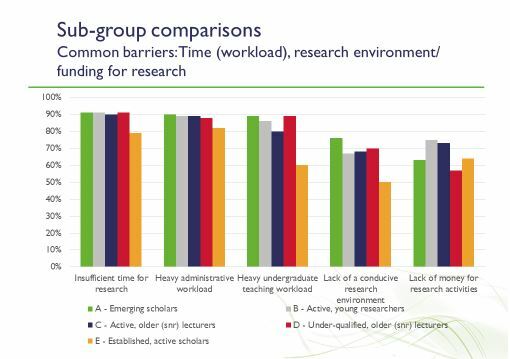 Other reported impediments were the absence of a conducive research environment; heavy supervisory workloads at the post-graduate level, the absence of research networks and insufficient mentors and role models in the system. For purposes of analysis of survey responses on a range of research activities, CREST divided the survey sample into five subgroups, namely: Group A comprising emerging research-inactive young lecturers or senior lecturers without a PhD; Group B made up of research-active young lecturers and senior lecturers; Group C representing active older lecturers and senior lecturers only; Group D comprising the under-qualified lecturers and senior lecturers, and Group E made up of established, active scholars, essentially the professoriate. The study found that with the exception of the established, active researchers, all the sample sub-groups griped about the absence of mentors and role models and also about a lack of research networks. 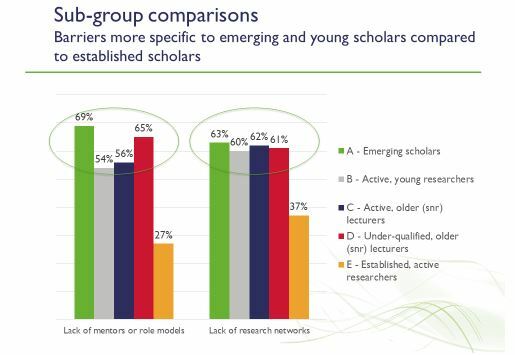 The study further found that both emerging and active young researchers (i.e. those under 41 years of age) and the older underqualified lecturers griped about the absence of mentors and role models and also about a lack of research networks. Intensify efforts to enable higher proportions of senior lecturers and lecturers to obtain doctoral degrees. That very low percentages of senior lecturers and lecturers were in possession of a doctoral degree was found to be the biggest structural barrier to research. Universities should be aware of the increasing disillusionment of young scholars with the current research performance culture and implement appropriate counter measures. A growing sense of disillusionment and even cynicism amongst younger scholars about the pervasive research performance management culture at SA universities – especially the unquestioning acceptance of measures such as the NRF-ratings or h-index scores for academic promotion across all disciplines, was found to present a risk to the sector that universities must revisit with urgency. Universities should consider implementing differentiated research performance appraisal systems for emerging scholars. Young scholars suggested that formal appraisal systems should take into account the stages of an academic’s career development and differentiate between different stages and ‘types’ of academics e.g. academics busy with PhDs, emerging scholars, post-docs, lecturers and senior lecturers. They felt that heavy and disproportionate teaching and administrative loads for lecturers needed to be taken into consideration when assessing academic performance. The changing nature of knowledge production requires new forms of capacity-building for emerging scholars. Many emerging scholars reported a need for assistance related to publishing which included: help identifying avenues of publication, methodological and technical assistance, and financial assistance to cover journal fees. Others mentioned insufficient knowledge about such matters as the h-index, journal impact factors and predatory publishing. Training courses and workshops were needed to address these concerns. More investment in mentorship required. Recognising that there was already a significant interest and investment in establishing appropriate, effective and viable mentorship programmes at many SA universities, the respondents suggested strengthening of existing programmes and that the role of mentors be clarified. Of the five key recommendations summarised above, three, represented by bullets 1, 4 & 5, received focused attention at the USAf-ACU symposium. Dr Diane Parker, Deputy Director-General at the Department of Higher Education and Training, shared selected observations of the Ministerial Task Team (MTT) that was set up by the then Minister of Higher Education and Training in 2017, to investigate blockages for effective recruitment, retention and progression of black academics in South Africa’s university system. The MTT, which was reportedly winding down its work ahead of submitting their report to the Minister, had observed, among other issues in the sector, that the inadequate postgraduate pipeline had its origins in basic schooling. Staff ranks profile of permanent teaching/ research staff was found to be skewed in favour of white male professors, most of whom were ageing and about to exit the system. 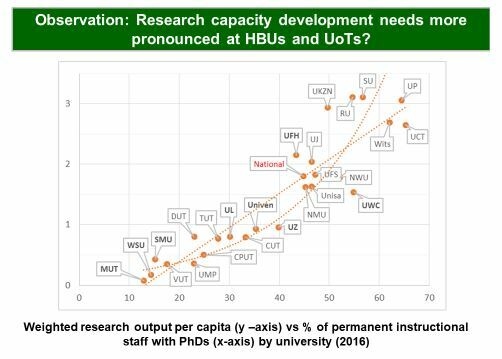 Research output per capita (2016 stats) indicated that capacity development needs were more pronounced at historically black universities and universities of technology. Dr Parker said this state of affairs called for a co-ordinated, collaborative response and an integrated strategy and pooling of resources, which would take a concerted effort from all universities, relevant government departments and all supporting partners. Interventions needed to address the entire academic pipeline starting with funding support for the entry level to post-graduate studies, i.e. Honours. The integrated strategy needed to be underpinned by responsive steering mechanisms and informed by principles of transformation and building a differentiated university system. 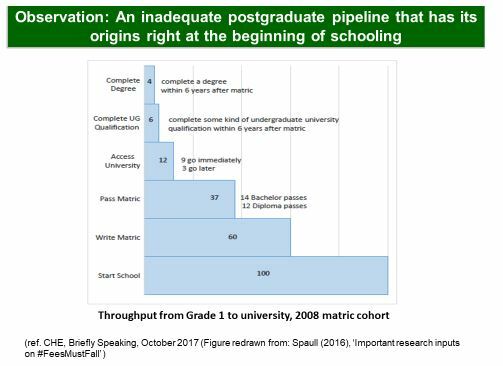 From the NRF, Dr Phethiwe Matutu, Group Executive: Strategy and Planning and Partnerships of the NRF said through the NRF Researcher Study completed in 2018, her organisation had identified additional (and also overlapping) challenges, including that the demographic profile of academic staff had not mirrored the changed profile of students; the leading international researchers (e.g. (SARChIs, A-Rated) were not representative of the demographics of South Africa and were ageing, and that the average time taken for an early career researcher to achieve an A rating is 28 years (from Y to A). In addition to the programme’s strategic intent she explained the qualifying criteria for funding. A link to her full presentation will be shared alongside all others in due course. On why the Association of Commonwealth Universities (ACU) was supporting South Africa’s early career researchers development programme, Dr Joanna Newman, Chief Executive Officer and Secretary General of the ACU said it was worrying that a glance at the 2014 global performance in PhD qualifications output showed 75% of the world’s production originating from OECD (Organisation for Economic Co-operation and Development) countries, a large proportion of which were European. 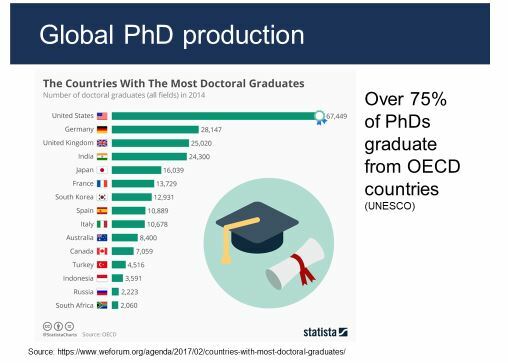 According to the OECD source, the top five global performers in the production of doctoral degrees were the United States, Germany, the United Kingdom, India and Japan in that order. As shown in the graph below, in comparison to the world players, South Africa fared at the bottom of the list. Universities’ role in building respect and understanding. Dr Newman went on to outline the various ACU programmes available to emerging researchers, some detail of which may be accessed in her presentation via the link below.